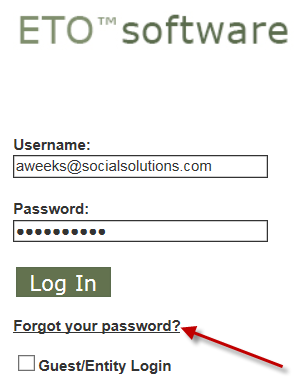 From your ETO login page click the Forgot your Password? link below the Log In button. 2. Check your email inbox for the Password Reset email. If it does not arrive within five minutes, please check your email filters. 3. Click the link provided in the email to reset your password. This link is single use, so if you click it and don't use the link, you will need to request a new password reset. Please note, as ETO is only fully compatible with Internet Explorer, it is highly recommended that you copy the link from your email into Internet Explorer if it is not your default browser. 4. Please contact your local Site Administrator if you find that you are still unable to log in. It is possible your account has been locked or disabled. Click here for more information on logging into ETO.